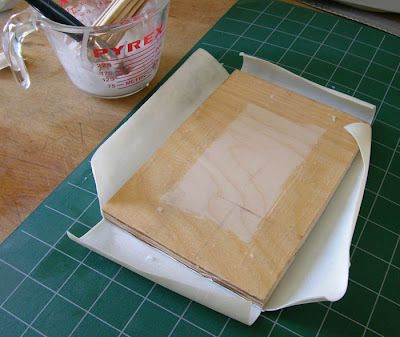 A couple of days ago I got my materials together and did a grand experiment: making a parchment covered panel. I had ordered wheat paste , an adhesive, from Talas (I bought 5 pounds, enough to last me the rest of my life), along with some acid free paper. I printed out the instructions from a very helpful blogpost on the Talas website. A local lumber yard had some small pieces of 1/2 inch birch plywood, which I cut into a 5 x 7 inch piece on my handy table saw, a machine I don't like using, approaching it with great care. The first step is to line the plywood panel with a piece of acid free paper, so the parchment will not be in direct contact with the wood. I mixed up some glue and applied it thinly to the board, then lay down the paper. I was having a hard time getting the paper smooth, so took out my rolling pin, and voila, it flattened the paper beautifully. While the paper was drying, I soaked an 8 x 10 piece of calfskin parchment that I'd ordered from Pergamena, a company located in the Hudson River Valley that produces leather and parchment. It becomes quite soft and pliant when wet. I left about 1 1/2 inches of overlap around each side of the parchment, then cut out each corner so there wouldn't be an overlap on the plywood's sides. 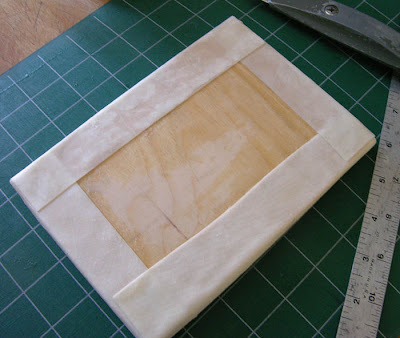 Then I applied glue to the outer 1 inch of parchment and panel. I pulled the parchment tightly around each side of the panel, one side at a time, then allowed it to dry. The result is a beautifully smooth and taut finish, velvety and inviting to the touch. My only failure is that a bit of wood shows on the side corners, so I'll have to be more careful in future when cutting the parchment. I'll do my next painting on this panel and will then have a chance to see how it behaves when in contact with the water in the paint, but right now it seems to have solved my waving/curling problem. If I want the panel to project from the wall rather than lie flat against it, I can glue some small wood molding to its back. All in all, a bit of work to produce the panel, but not onerous work, and I can take pleasure in the making of it. Lovely panel, lovely process...and lovely rolling pin. I use my grandmother's and hadn't thought of another til last night at our jury for Artisans Hand and here was a rolling pin for sale just like yours. I loved the way it handled. Thank you so much for posting this. I am thinking of doing something similar and I'm wondering how it ended up holding up? I found your site through the pergamena.net forum. I'd really like to try this, but its something meant to last, and I want to make sure it will! Joanna, the parchment used for medieval manuscripts has lasted for hundreds of years, so I don't see why it won't last very well stretched over a panel. I've been working with these panels for almost two years and have had no problems, even with the fact that they're stored in an unheated space in winter. In my training "vellum" in the modern sense is of pure drawn cotton fiber, whereas true "parchment" would be any animal skin, namely lambs. The only thing that will deteriorate skin will be any metallic inks, they will eventually eat through. Know it all finished...Question, I intend to use this wonderful technique to affix an ink drawing and make it more presentable, do you have a recommendation for a paste that won't bleed a synthetic India Ink? Thank you for this post. That definition, Anon, is not how I understand it at all. 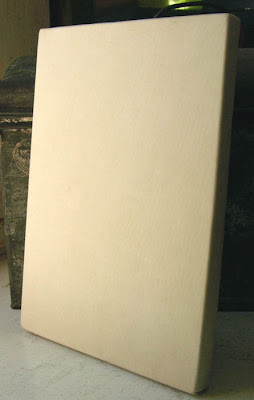 There is a paper that is called vellum, but it has nothing to do with the animal skin. Vellum is only the finest calf skin. I'm not an expert on technique at all, so cannot recommend a paste. Best of luck with it. You're very welcome, Terese. 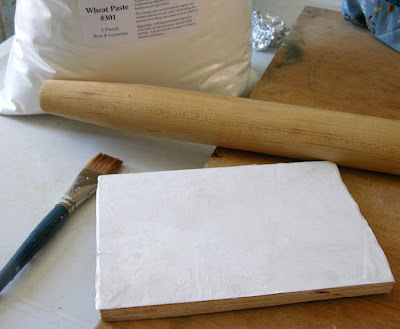 Some parchment/vellum is prepared on only one side, some on both. I like to work on a very silky surface, so use the smoother side.